$51.00 Ships within 24 hours. 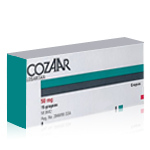 Cardizem® is the registered trademark of Biovail Pharmaceuticals, Inc.
Possible Uses of Cardizem: This medicine is a calcium channel blocker used to treat angina ( chest pain) or high blood pressure. It may also be used to treat other conditions as determined by your doctor. 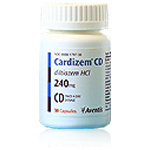 Before using Cardizem: Some medicines or medical conditions may interact with this medicine. INFORM YOUR DOCTOR OR PHARMACIST of all prescription and over-the-counter medicine that you are taking. ADDITIONAL MONITORING OF YOUR DOSE OR CONDITION may be needed if you are taking amiodarone, carbamazepine, cyclosporine, or digoxin. Inform your doctor of any other medical conditions, allergies, pregnancy, or breast-feeding. USE OF THIS MEDICINE IS NOT RECOMMENDED if you have a history of heart block, low blood pressure, severe heart failure, or certain abnormal heart rhythms ( Wolff-Parkinson-White, Lown-Ganong-Levine, or sick sinus syndromes). Contact your doctor or pharmacist if you have any questions or concerns about taking this medicine. How to take Cardizem: Follow the directions for using this medicine provided by your doctor. Precautions When Using Cardizem: DO NOT STOP USING THIS MEDICINE without first checking with your doctor. KEEP ALL DOCTOR AND LABORATORY APPOINTMENTS while you are using this medicine. BEFORE YOU HAVE ANY MEDICAL OR DENTAL TREATMENTS, tell your doctor or dentist that you are using this medicine. BEFORE YOU BEGIN TAKING ANY NEW MEDICINE, either prescription or over-the-counter, check with your doctor or pharmacist. FOR WOMEN: IF YOU PLAN ON BECOMING PREGNANT, discuss with your doctor the benefits and risks of using this medicine during pregnancy. IF YOU ARE OR WILL BE BREAST-FEEDING while you are using this medicine, check with your doctor or pharmacist to discuss the risks to your baby. Side Effects of Cardizem: SIDE EFFECTS, that may go away during treatment, include headache, facial flushing, or constipation. If they continue or are bothersome, check with your doctor. CHECK WITH YOUR DOCTOR AS SOON AS POSSIBLE if you experience tender, bleeding, or swollen gums; irregular heartbeat; dizziness; or swelling of the feet or hands. If you notice other effects not listed above, contact your doctor, nurse, or pharmacist. Drug Interactions of Cardizem: Drug interactions can result in unwanted side effects or prevent a medicine from doing its job.Inform your doctor about all the medicines you take with and without a prescription. Storage of Cardizem: Store at room temperature away from sunlight and moisture. Keep this and all medications out of the reach of children. Other Information of Cardizem: DO NOT SHARE THIS MEDICINE with others for whom it was not prescribed. DO NOT USE THIS MEDICINE for other health conditions. KEEP THIS MEDICINE out of the reach of children. IF USING THIS MEDICINE FOR AN EXTENDED PERIOD OF TIME, obtain refills before your supply runs out.